Blake Snell is already back in the minor leagues, but he probably shouldn’t be there for long. All the Rays need is an opening, and over the weekend Snell made his big-league debut in a spot start in Yankee Stadium. Everyone understood it would be a one-shot deal, but Snell got to get his feet wet. That counts for something. And we got enough data for a deep dive. That also counts for something. Most of you probably learned about Snell for the first time last season. He got himself onto the radar for something extreme, which is to say, he made his 2015 debut on April 9, and he allowed his first run on May 23. Snell is forever going to have his scoreless streak, but what he did in the minors isn’t what’ll allow him to succeed in the majors. No — he needs to keep on performing, and in support of that, we can look to something else extreme. Snell’s a pitcher, so he throws a fastball. The fastball he throws is unlike almost any other. 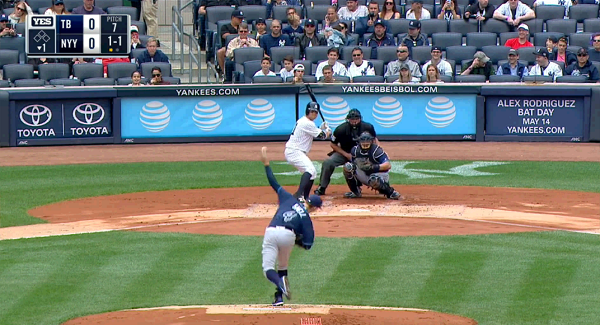 Snell has pitched one game, and, I don’t know, maybe the cameras in New York were miscalibrated. Maybe Snell, in time, will settle just near the top. But we already know that he throws a four-seam fastball with a ton of rise. That’s a swing-and-miss pitch, and a pop-up pitch, and it’s a pitch Snell was happy to elevate over the weekend. Just a few hours ago I wrote about Smyly and how his fastball is a strikeout weapon. Snell is also left-handed, and his fastball right now is harder. It might be a coincidence that Snell and Smyly look similar here, but the Rays love rising fastballs more than any other team. They’re the league leaders in four-seam rate, and they’re the league leaders in four-seam rise. They’ve liked this kind of fastball for a while, a fastball you can use at the top of the zone to throw hitters off the softer stuff you keep down. The Rays don’t have the only pitchers who work like this, but it’s safe to say the Rays know how a pitcher should use this kind of heater. Snell is in the right place. At some point the Rays will give him a long opportunity, and Snell will be great provided he just throws enough strikes. One strange thing — generally, when you have a pitcher who works with a rising fastball, that pitcher puts the ball in the air. Consider Estrada, Smyly, and Young above. In the minors, Snell has actually been something of a ground-ball pitcher, which I don’t know how to explain. Maybe hitters beat his other pitches into the ground. Maybe Snell has changed something about himself. What we do know from his record is that he’s long been hard to hit. Just based on his fastball, I’d expect him to be more of a fly-ball pitcher in the majors, but, flies or grounders, Snell will go as far as his control takes him. He has the other things that he needs. The curveball and fastball blend are separately interesting — Snell showed a velocity gap there of 21 miles per hour. This year, that’s sixth-biggest among starters, out of a sample of 138. He has a looping curve, and at the absolute most flattering, it’s reminiscent of Clayton Kershaw, whose velocity gap is 20 ticks. Kershaw also throws a hard, rising fastball, and while Kershaw has far better command and a more powerful slider, it’s never a bad thing to try to borrow traits from the game’s elite. In some ways, Snell could resemble a worse Kershaw. In some ways, he’s like a left-handed Michael Wacha. It’s never been easy to make contact against Blake Snell. He needed just five innings in the majors to show why. The fastball is extreme, and it’s in the right hands. The other stuff is solid, with hitters having to cover a massive velocity range. If a healthy Blake Snell fails, it’s only because he couldn’t throw enough strikes, but he keeps on getting better at strikes, and he’s now the closest he’s ever been. As I write this, Blake Snell is in the minor leagues. He’s going to want to get used to saying goodbye. We hoped you liked reading Meet Blake Snell’s Extreme Fastball by Jeff Sullivan! Great, another Jeff Sullivan Tampa Rays puff piece.